Rugosa roses are a beautiful species of rose that is grown primarily in northern cooler climates. With its single layer of flowers and crinkled leaves, this unique rose is very hardy and comes in a variety of colors. The Rugosa rose requires watchful removal of old blooms during its blooming season, and regular winterizing to keep it growing and producing well. Pinch the blooms off of the rugosa roses after they have finished blooming and started to die. You can pinch the blooms off with just your gloved hands and snap them off right at the base of the dead flower. Remove any suckers or shoots at the base of the rugosa that you do not want to grow and produce. For a thinner, more-structured plant, you would want to trim off all of the suckers with pruning sheers. If you want a natural-growing bushier rose, however, leave some or all of the suckers to help fill the plant in more. Trim 3 to 5 inches off of the end of the rugosa branches with pruning sheers to get the plant ready for winter, if you choose a more natural growing method. There is no need to cut the rugosa rose all the way back to the ground if you want to maintain a large bush rose, as they are hardy and can stand the winter cold. Cutting a few inches off of the ends of the branches will stimulate new growth and provide better blooming opportunities in the next growing season. Use pruning shears to cut the rugosa down to within 6 to 8 inches of the ground if you want a more controlled rose bush. Although the rugosa is hardy and does not need to be cut down to the ground, if you do not do so, it will continue to get larger and branch out. 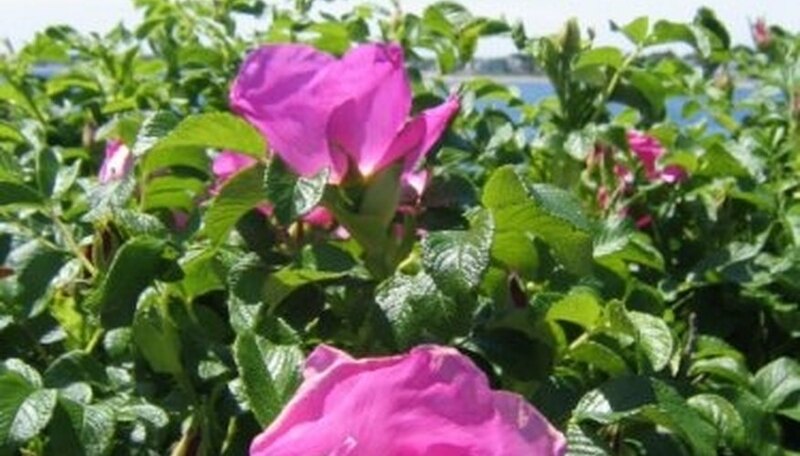 Fertilize the rugosa rose regularly and continue to remove dead flowers until the plant has stopped its blooming cycle. Visit the resource below for more information on rugosa roses. Leave the old rose blooms on the plant instead of pinching them off if you want rose hips to form for you to harvest. Wear gloves when pruning rugosa roses as they have thorns all over their branches.